Stitches and Scissors: Sew Mama Sew Giveaway! CLOSED. Sew Mama Sew Giveaway! CLOSED. I decided to giveaway a copy of the Sew to Swap book. I had a lot of fun contributing to this book if you want to read more on the book here is my post on it. I purchased this book with the thought in mind that I would give it away on my blog then remembered Sew Mama Sew giveaway day was coming and I thought it would be perfect! This book is perfect for any crafter! Just leave a comment on this post and make sure that your email is provided so I have someway of getting in touch with you. I will leave this giveaway open until December 16 at 5 p.m. PST. Don't forget to go over to Sew Mama Sew blog to enter more giveaways! Ok, I'm one of the first commenters because I really, really want this book! come on Mr. RNG! I've been having hun following your blog for a while! Would love a copy! I see it everywhere and keep lusting over it. This book looks like a great one! Fun giveaway! I would love to add this to my quilting/sewing library! Thanks for the chance! I have been coveting that book for a while now. It looks like so much fun! Thanks Darci! I would love this book! Looks super cute! Yippee!!! this one is on my wish list this year! This would be a great Christmas gift ... for me! I've been eyeing this book, would be great to win it! how fun - been wanting that book so thanks for the chance Darci! Ooh, I'd love to win a copy!! Thanks! would love to win this, thanks for the chance! Thank you so much for this great giveaway!! Oh...so want this book, looks great! I haven't seen this book "in person" yet, but it looks like one I'd like to have in my library. Thanks for the chance! Oh I would love this! Thanks so much for an awesome giveaway prize -- I, like, need this book! I'd love to add this to my library! this book has been on my amazon wishlist for a while hoping I'd get it for xmas! Thanks for the chance to win!! That looks like a fun book! I've been eying this book for a while now! i have really been wanting this book!! I would love to get my hands on a copy of that book. Thanks for the giveaway! Thanks for the opportunity Darci. Having been on the receiving end of some of your swap items, I know that they are always winners. I use my potholders everyday when cooking dinner. I am a craftster.org swap addict so this would be great for me! this book is on my "must have" short list... thanks for the chance to win a copy! I have this book on my wishlist, so keen to check it out in person. Great book! Thanks for sharing a copy! the bookstores around my house do not have this book!! want! hehe. this book looks lovely! such a soothing and bright aesthetic. I'd be pleased as punch to add it to my library. This book is on my wish list! So many inspiring things inside. Thanks for the chance to win! I would LOVE this book...thanks for the chance! A very useful book. Thanks for the chance. I'd love this book! Thanks! I have been wanting this book. Thank you for offering it! Thank you for the chance to win, this book looks SO inspirational and fun! Love the colors on the front page. Merry Christmas! It looks like a fun book. Thanks. I've been watching this book appear on blogs all over! Thanks! This book is now on my Christmas list! Thanks for the chance to win! This book is on my Christmas wish list ... would love to win it! Thank you for the give away! Hexies!!!! I am so wanting to learn to sew something with hexies. Thank you for a lovely giveaway! I'm new to the swapping world, so this would be great inspiration! Thanks for the opportunity to enter! This book looks great! Thanks for the chance to enter! i want, er, need this book!!! I would love to win this book. In fact, it is the title of this book that attracts me to come to your blog in the first place. I think the idea "Sew to Swap" is just great. What a concept! This book looks marvelous. Thanks! Count me in!! I forgot to ask you about it when I saw you. I would love this!! Have been wanting to get this book. Thanks for the chance to win one. I'm excited to get my hands on a copy of this, whether I win it or not! Thanks for the chance! Oh, I'd love this book! Thanks for a great giveaway! Congrats on the book and thanks for giving away a copy! I'll keep my fingers crossed, it looks inspiring. I'm getting more and more involved with swaps, this would be great! Thanks for the chance! Oh this book looks so beautiful and inspiring! Thanks for offering it as a giveaway! I've been "stocking" this book and I'm crossing my fingers I win!! Thanks for such a fun (unique) giveaway, Darci! I've been wanting that book! Thanks for the chance to win! Looks like a lovely book, I would love a chance to win! Awesome! This book is on my Christmas wishlist! Thanks for the chance. oh, I would SEW love this book!!!!!! Ooooo I love this book!! Thanks for the chance. Thanks Darci! I'd love to win a copy of this book! What a great prize! I have had this book on my Amazon wishlist since it came out. Thanks for the nice giveaway! I haven't seen this book before, so would be interested in checking it out. thanks! Ooh! I have wanted this for a while. I have been eyeing this book - swaps have been such a fun way to expand my skills! This looks like a great book, I would love to win it. 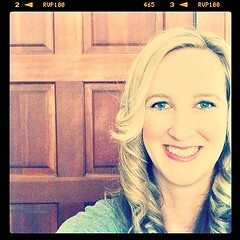 BTW, I'm new to your blog, but it looks great! I can't wait to see your finished Park Slope quilt. What a great book to giveaway. Thanks! Hopefully this book will help me have the courage to swap! I would be so very excited to win this! I would love to get my hands on this book! Thanks for the chance! The deadline is my birthday - maybe that will bring me luck! Our Modern Quilt Guild is doing all kinds of swaps this year. I would love this book. Hi darci! I can't wait to see this book, especially your project in it! I've been wanting to see this book! One snowman looked at the other and said, "Hey, do you smell carrots?" This is a fabulous prize. Thanks for the chance! Well, thanks for this super giveaway -- the book is on my Christmas wish list. This book as been on my wish list ever since I first saw it!! Great giveaway! Oooh very cool, I would love to win this book! Oh, I'd love to have this book! Thanks so much for posting this giveaway! This book is on my wishlist! This would add a lot more inspiration to my Christmas vacation! What a great giveaway!! Thanks for the chance! I'm a little shy about swapping -- do swappers mind crooked projects??? Looks like a book with lots of good ideas for gifts. I would love to own this book! Thanks for the chance to win. I would love this book! thanks for the giveaway! I have always wanted to participate in swaps but have been intimidated by the high standards of everyone else. I think this book would be a great to give me just that little confidence boost to participate in my first swap. I have read some great reviews of this book which is why it is on my Amazon wishlist!! Would love to win this book, it has been on my wish list since I knew about it. Terrific giveaway! Thanks for sharing. I am new to quilting so this book would be great reference tool for me! I hope I win! Thanks! I would love to win this book to add in my library and a good source of inspiration! Oh I would love a chance to win this book!! Thanks!! I love craft books.....this is on my wish list. What a fun blog and a great give away item! This book is on my wish list! I've been very curious about this book (haven't gotten a chance to see the insides) -- it looks like a real winner! Thanks! I love the simple and folky look of your book and would love to win it!! This looks really interesting, haven't seen it before. I haven't done a swap yet so this would be perfect. Thanks for the giveway. I have this book on my wish list. My birthday is this Saturday, and this would be a wonderful birthday present! Looks like a fun book! Thanks so much! This book would be most helpful in my sewing. wow! that book looks awesome! That book looks pretty interesting. Thank you so much for this chance. I'm having a SMS giveaway too. What a nice idea! Thanks for the giveaway! Merry christmas, what a eonderful prize, i would love to have a copy of this book. Hope you have a very Happy holiday season. This book is #1 on my wish list! Thanks much for the chance to enter. this looks like a fun book! i'd definitely like to win that! Thanks for the giveaway! I would love a copy of this book. I've never participated in a swap before - I'd love to take a look at this book. THis is a book I am eager to see, as I love swaps and bees! Yay for you for being part of it! The book looks lovely. Can't wait to take a look later win or not! I would love to win that book! It has so many goodies in it!! Thank you for the chance. That looks like a good book. I haven't seen it yet. Merry Christmas! I've heard many good things about this book and would love to add it to my quilting collection. Thanks for the chance to win and i wish you a very happy holiday season! I sew everything but quilts, so this book looks like a great jump into quilting! Great prize to win. I've been a follower via GFC & RSS Feed. Cool. I'd love to win this book. 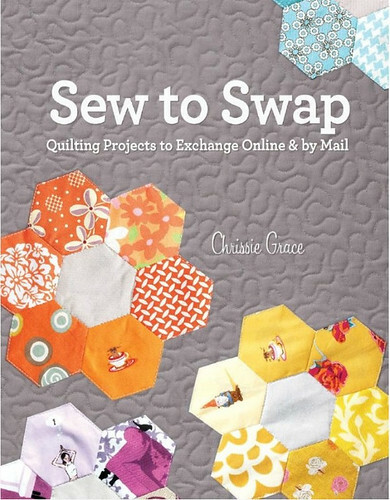 This book looks like fun, and I want to know more about online swaps too! Fun ! Thank you for the giveaway! I love this giveaway! Thanks for hosting it. Thanks for hosting such an awesome giveaway! This book is on my wish list! !